I hope everyone has had a nice new year so far. There is also a fairly involved video interview, where Johnny plays some snippets of a few Smiths tunes. 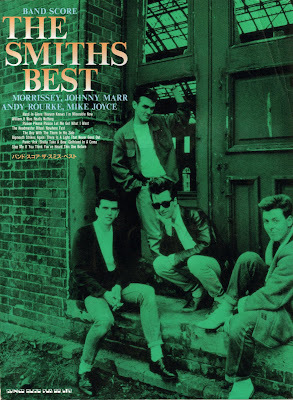 I have recently made some site updates and have added all the tabs from the Smiths Best complete band score, which was published in Japan by Shinko Music. This is one of the Smiths tab holy grails, beside the Off The Record book. It's a complete score which includes multiple guitar parts as well as drum and bass parts. Here's a photo of the cover. The tabs have been added to their respective song entries. I'm also putting the finishing touches on Andy's bass gear section. It's been long-delayed, but it should be online in a week or so. If anyone has any suggestions, please put them in the comments. Brilliant! Thanks for posting, keep up the good work in 2012! My new favourite site...fantastic job. Brilliant. Cheers Thom. Only found out about this this book last week. Any chance of a single pdf of the entire book (or a zip file with all the files in) please ? I love your blog! big up from Hungary!